Nuts are a staple snack in our house. In the interest of health, I've been avoiding buying the pre-roasted, salted varieties. So, I buy raw nuts and toast and spice them myself. 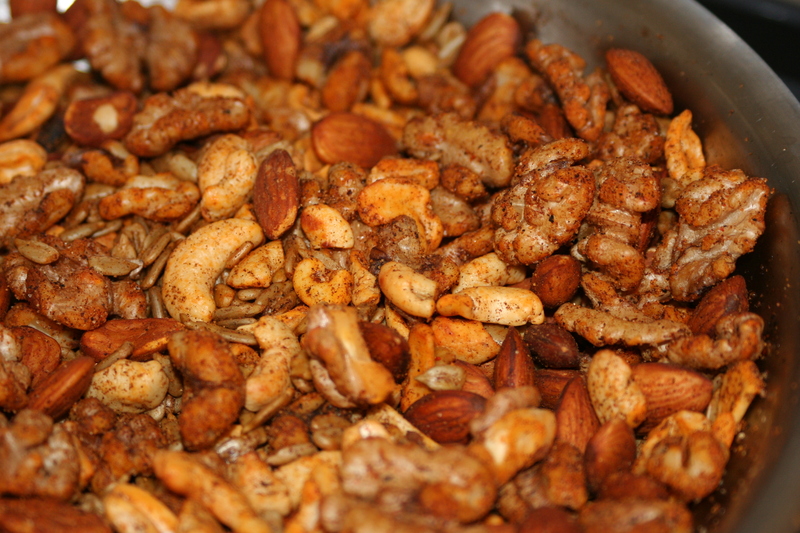 This is our favorite savory spiced nut recipe thus far. It's also quite easy as it's all made on the stovetop. Once completely cooled, store the nuts in a glass jar. In a large skillet, heat olive oil over medium heat. Add all the spices and stir to make a paste. Add almonds, walnuts, and sunflower seeds and stir to coat evenly. Continue stirring the nuts, toasting until fragrant, about 5 minutes. Cool in the pan. this sounds like such a good snack! I think Luke and I would both enjoy this.